It was everything I thought it would be. There was a standard sized baseball field and a bunch of seats. It was dirty, it was old, and it was beautiful. Just like my first NFL game at the RCA dome, I was shocked by how small the field was. You watch these games on TV and it seems like the field should be bigger, but an NFL field is 100 yards long, and a MLB field has 90 feet between bases. It’s the same size. I successfully navigated the Chicago area transit system. I drove from Indy to Gary, parked my car (I know, I was surprised when it was still there when I got back), and got on the train. 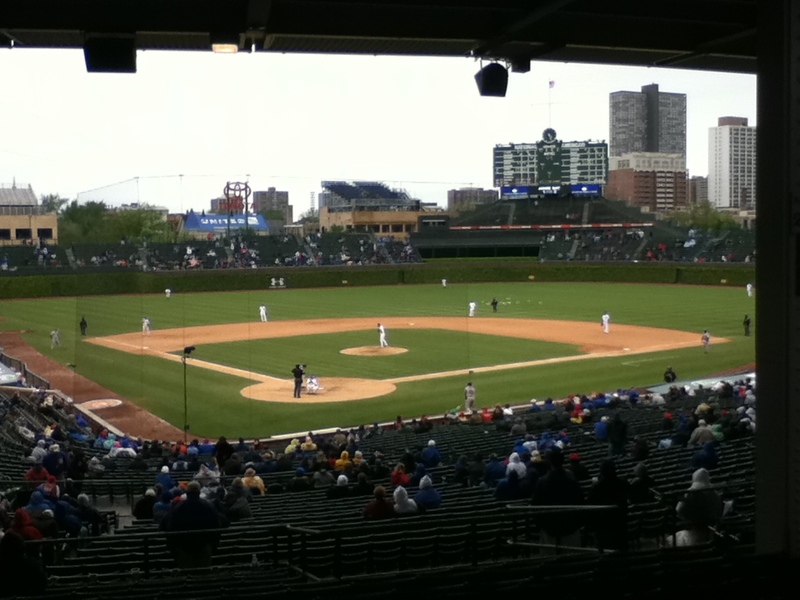 Then in downtown Chicago I got on another train to Wrigley, which dropped me off a block west of the stadium. Of course my iPod and phone both had low battery by this time, but I had no way of recharging them. I saved them for taking pictures and contacting people. I got in touch with my family (brother, brother in law, and nephew), and we went in the stadium. How was it? It was COLD! April 1, 2011 was opening day. That’s usually pretty cold. This year it was 46 degrees on opening day. How cold was it last Thursday (May 26th)? FORTY DEGREES! And there was a 12-20 MPH wind blowing in from the outfield, making the windchill around 33 degrees. I loved being there, experiencing the history of it, and watching the Cubs play live, but the cold was like too much cinnamon in an apple pie: the pie tastes good, but the cinnamon is ever present. This was before the game started, when we were still basking in the warmth of "first time at Wrigley"
At the beginning of the game we were surrounded by NY Mets fans. But after a few innings they left. 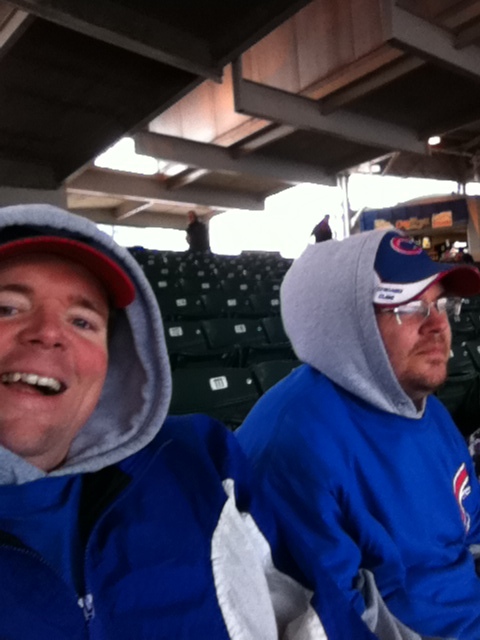 Not sure if the cold was too much for them or the Cubs (it was 4-1 Cubs in the fourth inning, and 6-2 in the fifth). 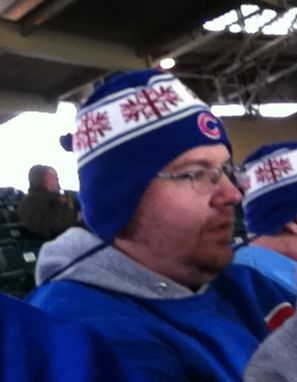 My brother, looking awesome in his Cubs stocking cap. Dig the tassels! I know. It is teh awesome! 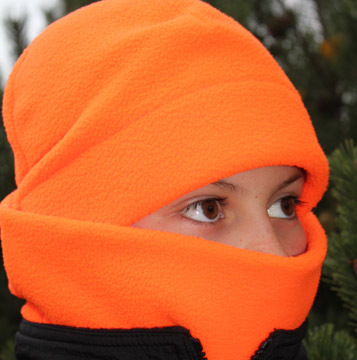 This is how I look when hunting, but without the pretty eyelashes. The irritating thing was that two days later the temperature was about 30 degrees warmer. I saw people on television at the Cubs game wearing tank tops and shorts. But that’s ok, because the Cubs won the day we were there. We got to see the W flag fly, and we got to sing “Go Cubs Go” at the end of the game. 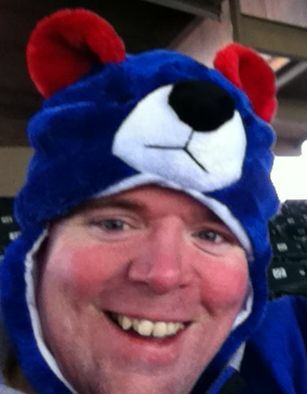 Evidently I need to get back to Wrigley, because the Cubs have only won one game in the week since I left. I would like to go back again sometime (probably not til next year or later), but whenever it is, NEXT time it will be in June-August. Go Cubs!